I’m on a mission to find new ways to get veggies into the boy. He likes veggies and on a good day will eat pretty much anything. However when he is under the weather or teething he pulls a right face and hands it all right back to me. Which is frustrating. I find as a general rule he isn’t as keen when he is given large chunks of vegetables on the side of a meal. What he really gets on well with is having small pieces of vegetables mixed in something. All well and good, but it can leave me scratching my head a lunchtimes. Lunch in our house is often a quick, thrown together, snack type meal – typically with vegetables on the side. 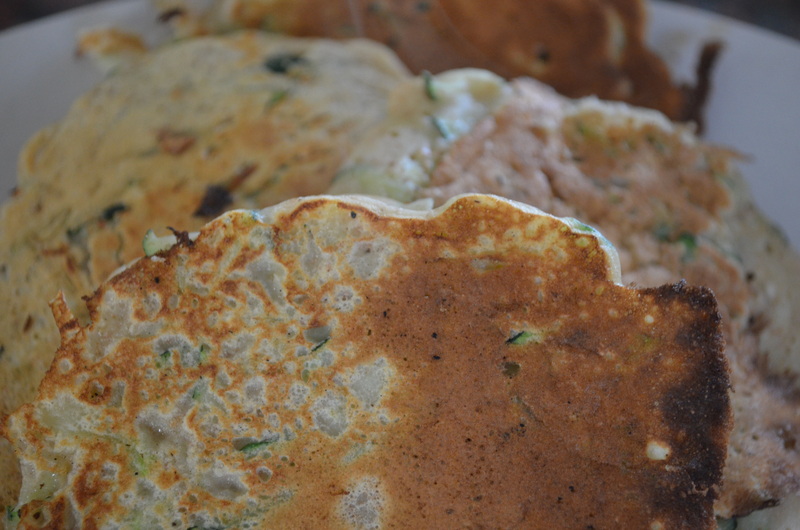 So today I tried out adding grated courgette to my pancake recipe. OH MY DAYS. This was good. Amazingness in a pancake. Miss K doesn’t like courgette but will tolerate it if I grate it. She ate these up, asked for more and gave me a pass mark. The boy looked at them and snarfed them up. Then asked for his train book “Choo Choo” Top marks I think. “Mummy you can make these again” Miss K.
A quick lunchtime recipe that boosts the veggies up. Can be bulk cooked and frozen. Now add the egg and milk, beat together. Grate the courgette into the mix and stir in. Heat a pan or griddle plate until it is steaming hot. Wipe a small amount of oil on a piece of kitchen roll around the pan. Pour a ladle of pancake batter in and cook for a few minutes on each side. Super tasty when eaten warm with a little cheese on top!